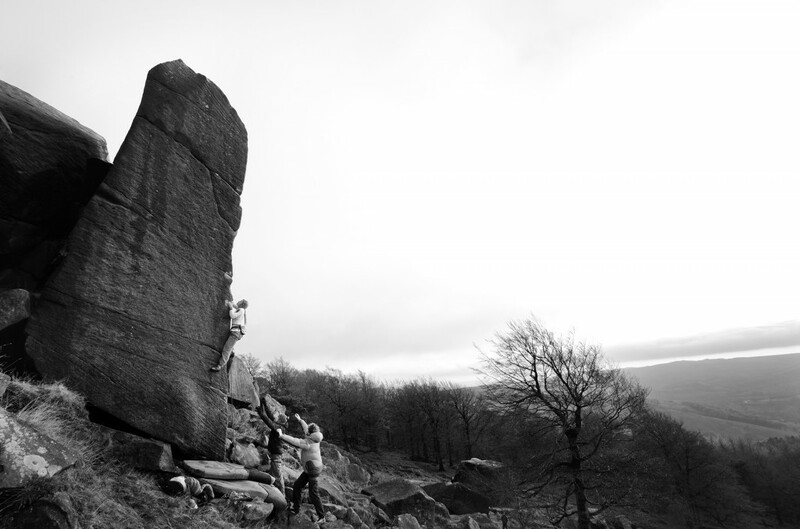 Hanging out, bouldering at Stanage Plantation it is impossible not to look at the giant, imposing arête that is Unfamiliar. I remember watching Dan Varian and Ned Feehally trying it above pads one time and thinking they were mad. At the same time, seeing them there moved Unfamiliar in my mind from being a scary trad route, to a highball: a small shift in perspective but a powerful one. I have very little trad experience but I have done a fair bit of highballing. The climb was on my “one day” list, a mental reference to things I was keen for but also scared of. Although all the hard climbing was now being done above pads as a highball, the top section was above gear and was not trivial. Last week, David said he was keen to get back on it and I took the chance to go along and have a go. It was one of those perfect blue-sky grit days, even maybe a bit too cold! At first, I really struggled with the beginning section, not finding the body position and failing to commit to rocking up onto the arête. Call me a wuss, but even with pads it felt insecure, like you could pop off in any direction and tumble down the hill! I got more and more confident but was still not fully committing. 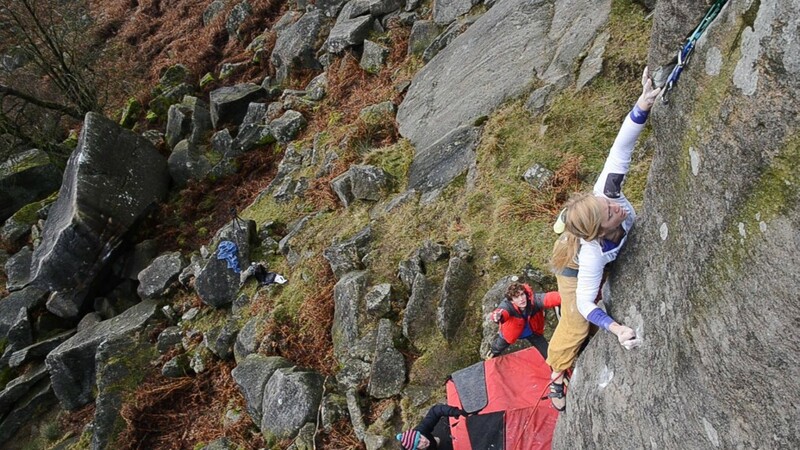 My highpoint that day was the top pocket and the left arête, not being able to make myself do the foot moves. I jumped off from there and went home annoyed with myself for being scared. It was an inspiring day though as Ethan and then David both lead the route successfully. I was determined to go back in a better headspace. So the following Friday we went back. In the three days between, I had been ruminating con about the route, watching footage, and even dreaming about it! I visualised getting to the same place but in my head I wouldn’t hesitate or be scared, I would just keep climbing. I visualised the top section too, unknown except for watching other people and tried to mentally rehearse what I was going to do when I got there. I tried to practice not being scared. So we went back and I was a lady with a plan (doesn’t rhyme so well…). Except the weather was not what we had hoped and everything was wet. Unfamiliar was not completely wet, but the top half was and so we waited to see if a wind would pick up and dry it for us. As the afternoon went on it began to look a lot drier and David abbed down it to chalk the holds and check out the condition. It looked okay so he pre-placed the gear for us (I will come back to this) and Nathan and I began to work it from the ground. The conditions actually felt really good on the bottom half and after a few goes I found myself at my previous highpoint but committing this time and pulling through to gain the break and clip the gear. I had planned to rest here for a bit and compose myself but on reaching the break I realised quickly that I couldn’t reach the good right foothold anymore (that the others stood on to shake out a bit), so was unable to shake my right arm out easily. Sod’s Law was in full force as that was the pumped arm from the small pockets lower on the climb. So my mental process went something like “ better get on with it then, before this pump gets any worse” and I proceeded to the next moves. The top section was actually fine, it went pretty smoothly to begin with but I was aware that, although the handholds were dry, some of the footholds were a bit on the damp side. They were making that horrible scrittely sound. Pulling over the top onto the slab is not hard but it’s also not as simple as getting out of a pool and requires some smearing (on fairly good holds). As I pulled over the top, both my feet popped at once and I was very nearly off! I managed to compose myself and try again, topping out to a mixture of adrenaline fuelled relief and happiness. I have always wanted to climb that line and I was so happy to have done it. For the sake of clarity, I would like to talk a little about the style of my ascent. I climbed Unfamiliar ground up, above pads with pre-placed gear. Ground up because I had not got to a point where I felt a rope was needed to work the moves (but I would have considered it later on had I not had success). This ties in with trying it above pads – ground up is much safer and more achievable that way. I essentially saw the climb as a boulder problem that had a bit of gear at the top rather than a potentially leg-breaking trad route above no pads. Each to their own, but this was my personal choice. Regarding the pre-placed gear, I have very minimal gear placing experience and was not confident placing the gear on lead. So it was another personal decision. Placing gear is a skill and an art and I have the upmost respect for experienced trad climbers. I would not be so bold as to jump in the deep end and assume I can do it well with little practice. Perhaps in the future, with more experience I will make a different decision. Lastly, the style in which I climbed it is exactly the same as many other ascents of this route, including that of Ethan, Dave, Ned etc so perhaps times are changing and there is simply more than one way to skin a cat.